Although undiscovered until quite recently in my life, I have a huge passion for radio presenting, and this is a page dedicated to my year on URY, University Radio York, as well as future plans and aspirations for my involvement in radio broadcasting. 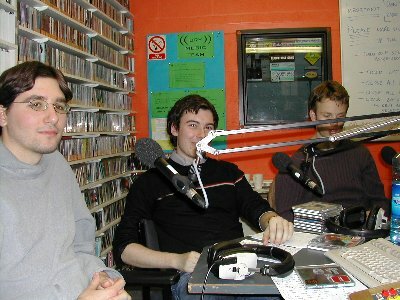 The photo above shows me live on air presenting Jazz Blues Fusion in the studios of URY, and the one below shows a group of guests who I regularly had on the show and who are also good friends of mine, helping me out with some great comment and chat, as well as some good music selections. The style of my old show, Jazz Blues Fusion is mainly jazz and blues mixed with other similar and related styles. There are a variety of different and interesting features throughout the show as it has evolved, some of which I have been told are pretty good. While I have provided download links below for all of my shows you will find that these are not available to the world without a username and password. This is due to URY licensing restrictions. I am however allowed to provide access to this audio to people who might have a stake in my radio presenting future, such as radio stations, potential employers etc. so if this applies to you then please contact me for access. If you know me personally and want to hear what I sound like on radio if you haven’t already then by all means get in touch too. With respect to the show audio please accept my apologies for my being slightly rusty on my first few shows (it was my first time on air – the later shows are much better). Also please bear with (or skip through) the first few minutes of shows that have either news or other music (not jazz, blues or fusion) at the start of them. 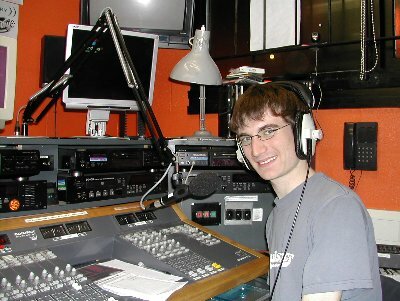 I never did get back into radio presenting as a student in Leeds but I’m still very keen on being back on the air. Who knows, now that I’ve settled down in Swindon perhaps I might be able to play some kind of a role on BBC local radio!